Only last month, the BBC's political editor, Nick Robinson, described them as "the biggest problem" with his Newslog blog. 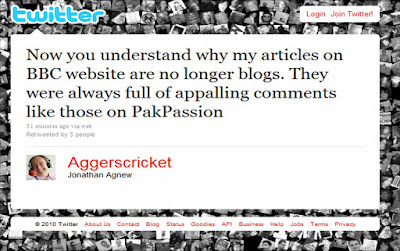 Now cricket correspondent Jonathan Agnew has revealed he stopped blogging at the BBC because his posts were "always full of appalling comments". Agnew now publishes a column on the BBC website instead and says he simply wouldn't write a blog open to comments any more - "even with moderation in place". Agnew's Twitter updates about comments came in the context of an interview (BBC i-Player 7:38:30) he conducted with Pakistan's one-day cricket captain, Shahid Afridi, after yesterday's defeat to England. The interview came at the end of an acrimonious and controversial tour for the Pakistan team and was discussed on the PakPassion website after Afridi apparently became annoyed at one of the questions. Agnew linked to a comment on PakPassion which accused him of trying "to be clever" in his questioning to incite further controversy around the use of the Decision Referral System (DRS), whereby teams can ask for television replays to overturn the decision of the onfield umpires. Agnew maintained that he was simply asking Afridi to explain why he wanted to have the DRS in One-Day Internationals. The system was used in the Test series. 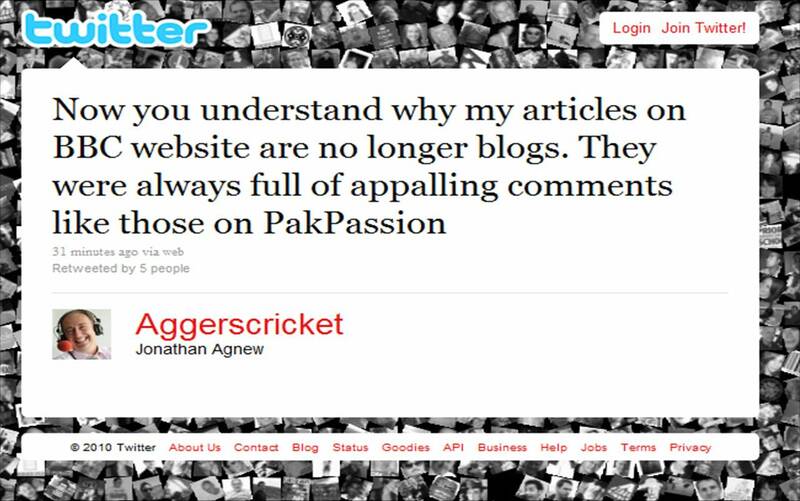 Agnew likened the comments on PakPassion to those he would receive on his BBC blog. Interestingly, despite his disillusionment with blog comments Agnew regularly replies to messages he receives via Twitter.